Fiocchi's .357 Sig round is one hot number. Fiocchi's .357 Sig load proved to be accurate and reliable—making it a terrific choice for practice ammo—but it produced way too much penetration for most defensive or law enforcement applications. In this day and age of high ammo prices, we overlook sometimes a simple detail: You need ammo to practice with. And given the tight availability and high prices of the premier defensive stuff, you need substitutes. Those who favor cartridges off the beaten path have an even tougher time of it. Take the .357 Sig, for instance. More than one department has adopted it due to its performance. I know that the Chicago Transit Police went to it not because of its flat trajectory (they are not providing covering fire from one station platform to the next) but because of its penetration. Apparently train seats and windows are very rugged, so stout they could not be penetrated by other handgun rounds--hence the adoption of the .357 Sig. Fiocchi is an importer and manufacturer of ammunition. It imports some from Italy, the home base, and manufactures some here in the U.S. The .357 Sig ammo we're testing comes from overseas. The cases are gilding brass, and the bullets are 124-grain truncated cone full metal jacket. The load is a hot one. Out of my five-inch Colt Delta Elite with Bar-sto barrel, the bullets averaged 1,395 fps. The accuracy was plenty good, as I was easily able to shoot two-inch groups at 25 yards over sandbags. As you'd imagine with a load that hot, drop at 100 yards was minimal, and as long as I was paying attention to trigger follow-through, the gong was in danger of being thumped. The empties were not abused, the primers looked just fine, and the cases were not scuffed, dinged or mangled. They would probably reload with no problems, as all other Fiocchi brass has reloaded just fine for me. So I proceeded to the penetration tests. Expecting a hard, jacketed little bullet like that one to deform in any way would be a fool's quest. Fully jacketed 9mm bullets typically have to be driven sideways through a railroad tie to get them to deform. Truncated-cone bullets penetrate better than those of the same weight and diameter that are round-nose. Why? I'll leave that to someone with fluid dynamics software and the need for an engineering project for a paper. Lacking deformation, I expected the bullets to keep going through anything I had on hand. I hauled out my two blocks of ballistic gelatin and slapped them on the table. Considering the penetration depths I've seen other truncated cones bullets achieve, I added a couple of water jugs at the back end. I really didn't expect the bullet to stop in the gelatin, nor the jugs, but I was not prepared for the authority with which the pepper popper that happened to be behind the jugs got hit. It was struck hard enough to knock it over. In one test, the author got 54 inches of penetration in ballistic gelatin out of the Fiocchi ammo, the bullet stopping only once it hit a bulletproof vest placed behind the gel blocks. I hauled out all the water jugs that would fit on the table. Fourteen one-gallon jugs (I only had the two gelatin blocks) lined up side-by-side. That's as many as the table allows. Seven feet of water, with 28 plastic walls. The bullet went through those and the 2x4 I had propped up at the back to keep the jugs from falling off the table. My next test was at a law enforcement class where I'd have access to a dozen or so blocks of gel. There, I stacked them four in a face, three blocks deep. As each block is 18 inches long, that gave me 54 inches of gelatin. On a hunch I draped an old bullet proof vest panel over the back. I needed it. Three of the four bullets were against the vest, having exited the back of the gelatin blocks. The fourth? Who knows. It managed to penetrate the whole stack, miss the vest and keep going. In case anyone wasn't paying attention, this is not the ammo you want to be carrying for defense. At 54 inches plus of gelatin penetration, you can count on pretty much 100 percent of the shots you hit bad guys with to exit their far side. NYPD found that out the hard way when it issued full-metal-jacket 9mm ammunition with bullets leaving the muzzle at almost 300 fps lower velocities. In the crowded confines of New York, they were starting to experience frequent bullet exits on felons and had bystanders struck by some exiting bullets. I could see issuing or using this ammo for defense in some specialized situations. 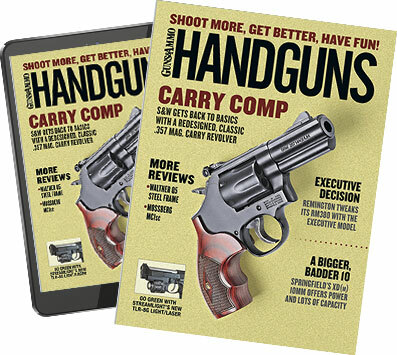 A state trooper or highway patrolman, for instance, working around cars all the time, might want this load in the second spare magazine on his or her belt. As my friend Mas Ayoob has pointed out, if things have gone on long enough that you need the third magazine, the other guy or guys are probably behind cover. For a trooper, "cover" means automobiles. You can expect this load to do better than any other handgun round when it comes to sheet metal and auto glass. Except for that need to penetrate cover, I can't see using this for defense. But as practice ammo it is first-rate. It is accurate, it hits to the same point of aim as the other, hollowpoint loads I tested alongside it, and the recoil is comparable. If anything it is even a bit hotter than some of the JHPs I tested. If you have the desire, the empties are eminently reloadable. Just keep in mind that the .357 Sig has a short case neck, and neck tension is very important. If you don't have enough neck tension you could get bullet setbacks on recoil and feeding. At the pressure of the .357 Sig, even a small increase due to bullet setback would be bad. Those of you who are in love with the .357 Sig cartridge or use it because it is your issue round, you should seriously consider this as a practice load. And maybe, just maybe, for that second spare magazine on your belt.